It’s back! 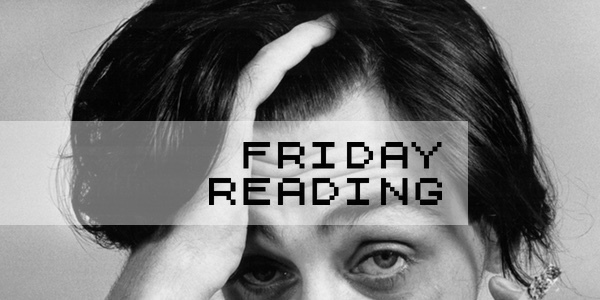 Friday Reading is a weekly series of recommended reads from the Guardian’s social media idiot Martin Belam, covering journalism, media and technology, and other interesting nerdy things. It is also available as an email newsletter. Sign up here. Complex reaction to the death of Sean Hughes. I absolutely loved Sean’s Show at the time, and this clip which in the space of a couple of minutes features cameos from Crystal Palace players including Gareth Southgate and Chris Coleman, and then moves on to Robert Smith from The Cure awkwardly playing the part of Sean’s long-lost real mum is a joy. Series one is available on demand. But there was a much darker side to Sean’s character than his on-screen persona, and this personal and difficult piece about Sean by Michael Hann has been one of the most read things on the Guardian site this week, with an average attention time of over 3 minutes. Being sexually assaulted is traumatising at best, life destroying at worst. The men who abuse their power and position in the media, in entertainment, and everywhere else are the lowest of the low. Something I hadn’t seen discussed in light of recent events is how they treat the women they don’t seek to abuse. In so many cases, men who sexually harass women struggle to register the existence of those other women, the useless ones. The thing you must understand is that we all know. Not about you, specifically, although if that sentence made you think I meant you — if the hair on your neck stood up or you felt a hot flush of shame at the prospect of being found out — then yes, we know. She remembers and probably her friends do, too. They told me. This is brilliantly written and takes the theme into looking at how we would design cities and urban spaces if we actually prioritised the safety of women. Multimedia Producer for Social Video at the Guardian. Everyone loves push alerts, but there are problems. Like: What if readers don’t actually open them? – some good data and research in this on how news orgs are using push. I don’t understand why people on both sides of the Atlantic are, under the guise of “free speech”, pushing for Nazis to have access to universities to hold events. I can’t believe that it’s even up for debate that Nazis are bad. I’m 46. Literally my whole life until about 3 years ago everybody knew that being a Nazi was bad. Now apparently it is an outrage if they don’t get to hold rallies at university. I never thought the way I would become middle-aged and old-fashioned and a fuddy-duddy was clinging to “Nazis are bad” as a moral position. Really shocking read about what happened to these women after the refuge they were living in became uninhabitable. This related piece looks at the systematic defunding and dismantling of women’s refuges across the country. This is what happened to the scientist who stuck his head inside a particle accelerator. Szechuan sauce, man. What a lot of madness.